This was a very satisfying week of cakes. I think about all the clients' smiles we saw and how one cake differed greatly from the next one. I fell in love with each and every cake this week, including this flowers, butterflies and fairy themed birthday cake we made for Siena's birthday. Rick made a handcrafted custom fairy figure standing on top of a flower surrounded by butterflies. It was a gorgeous cake, so pretty and cheerful and perfect for a sweet little girl. The cake was also colorful inside with our Guava Lava flavor. 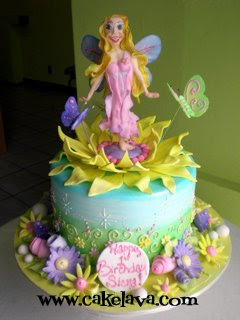 Check back next week to see another flowers and butterflies cake (sans fairy) we recently finished. It's quite different from this one but just as cute!